Last major update issued on September 23, 2010 at 04:45 UTC. 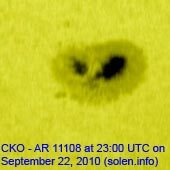 The geomagnetic field was quiet on September 22. Solar wind speed ranged between 289 and 344 km/s. Solar flux measured at 20h UTC on 2.8 GHz was 84.8 (up 11.4 over the last solar rotation). The planetary A index was 2 (STAR Ap - based on the mean of three hour interval ap indices: 2.0). Three hour interval K indices: 10000012 (planetary), 11001001 (Boulder). Region 11108 lost the trailing spot. 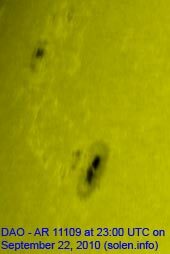 New negative magnetic flux emerged just north of the single penumbra, however, only a tiny spot emerged. Region 11109 was mostly unchanged and could produce occasional C class flares. September 20-22: No obviously Earth directed CMEs were seen in LASCO or STEREO images. 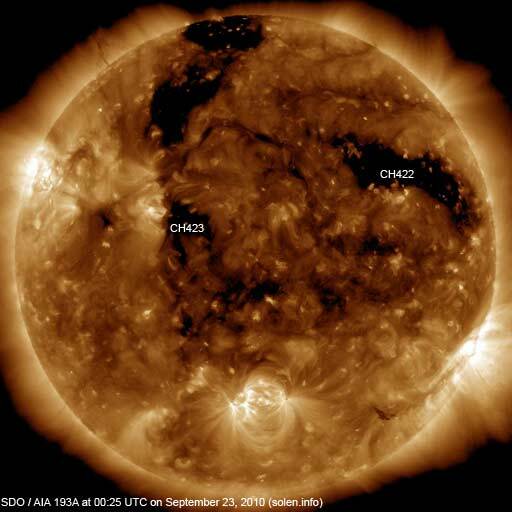 A large, well defined, recurrent coronal hole (CH422) in the northern hemisphere was Earth facing on September 18-21. Although still large, CH422 is considerably smaller than one rotation ago. At the current rate of decay CH422 will close within the next rotation. 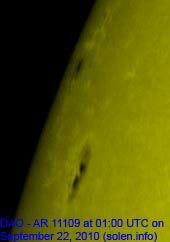 A small trans equatorial, recurrent coronal hole (CH423) could rotate into an Earth facing position on September 24. 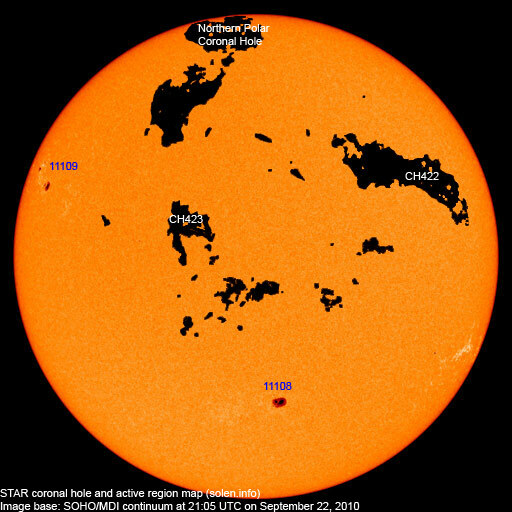 The geomagnetic field is expected to be quiet to unsettled on September 23-25 due to weak effects from CH422 and on September 27-28 when effects from CH423 are possible.